I have another new card to share. This time it is an anniversary card. As soon as I came back from vacation, I found that I needed an anniversary card. 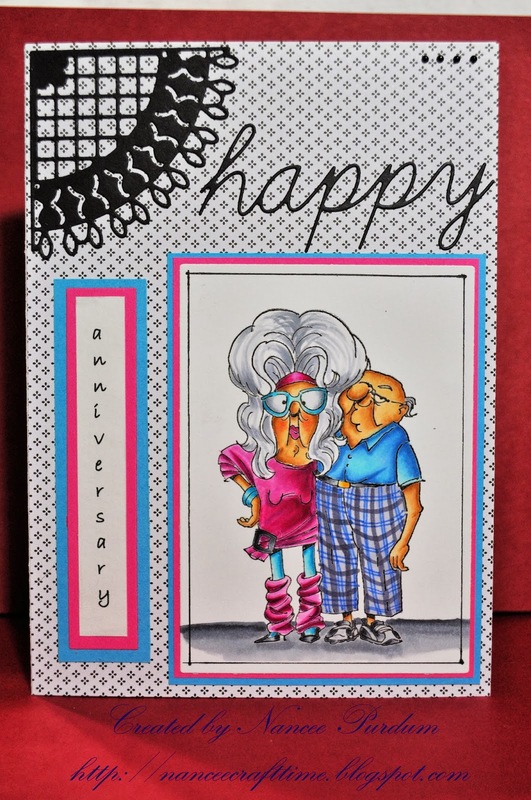 I found this stamp from Art Impressions and thought it would make a great, and funny anniversary card. I just received some new dies from the Magnolia-Licious Store and decided to use one of them on my card. I used the “CrochetCorner” Poppyseed die. I had also previously purchased the Memory Box “happy” script die from the store. I used Copic markers to color the image and just layered it with some paper from my stash. A close up of the front image…….. Your card is absolutely adorable!!!! Love that corner die! I know it is hard after a vacation to get back into things. You have done a fantastic job colouring this funny image LOL. The crochet die is lovely. Oh my!! 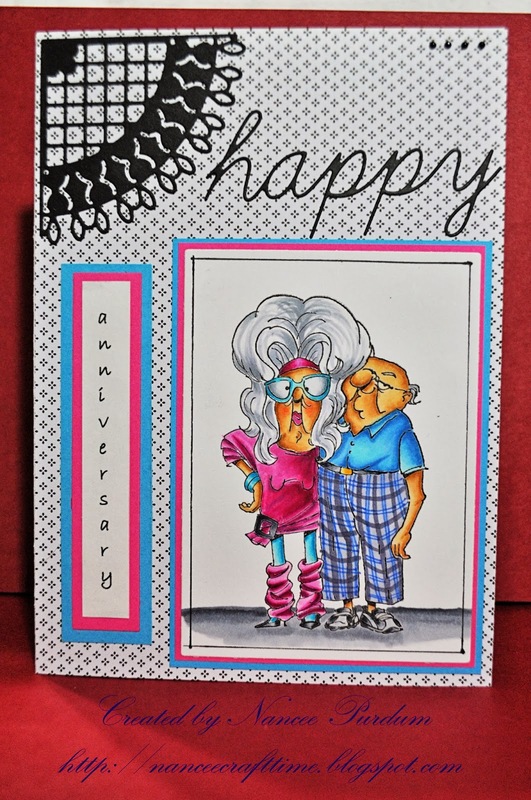 what a wonderful card this is Nancee, your colouring and use of dies are amazing. Beautiful work sweetie. Nice to see you back creating. 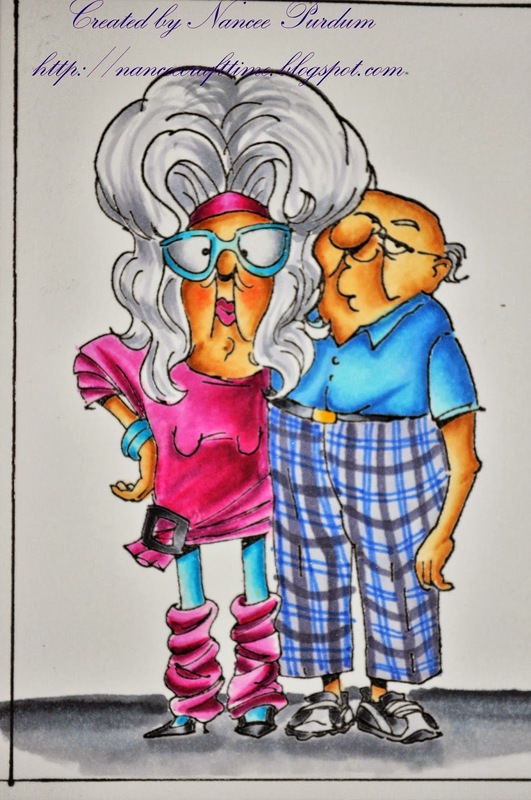 Oh, Nancee, I so love your card! It just cracked me up! I have already begun searching for my lost youth! I love the image of the gal! Great job on the coloring, too! I'm going to smile all day remembering this adorable card! Thanks for making my day! Nancee, that card is a hoot! I love her hair and the legwarmers? OMG so funny! Thank you for making me smile! This is a great card. Wonderful coloring. What a cute couple, looks my hubby, hair that is. Great card Nancy! I can cetainly relate to this !!! Cracks me up but I'm hoping I don't look QUITE like that in the next few years. Great card Nancee.